In August 1914, the company had an unfulfilled order from Krupps Armament Works. In view of the impending hostilities it was decided not to proceed with this or any other orders destined for Germany. In August 1914, Mr. O.F. Rudloff, a book keeper in London Office was dismissed the company service due to the national feeling against persons of German origin. He was however, assisted to emigrate to New York, in October 1914, to work for the Henry R. Worthington Company. At the commencement of the First World War the Directors agreed that for married staff with dependants, called to service, the company would make up their service pay to two thirds of their previous salary. For married men without dependants, to half their previous salary. 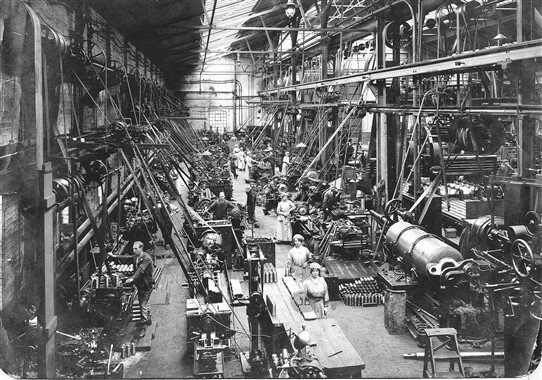 At the start of the First World War Charles Liddell Simpson (who had designed the layout of Balderton Works) became Chairman of the Patent Die Castings Co. Ltd. with special attention to the manufacture of fuses. Sea mine firing mechanisms were assembled at the Grosvenor Road Works in London. The Company was a controlled firm under the Munitions of War Act. In 1916 the Company was publicly thanked for adaptation of the Works for the manufacture of shells. In February 1916 the British Government asked if the output of 9.2 inch Howitzer copper driving bands could be increased. It was forecast that 1,500 per week could be produced with new equipment. Three Morgan tilting furnaces, one annealing furnace, one platform weighing machine and a cast iron bin for copper scrap were ordered at a total price of £1,184/-/- including installation. In 1917, Sir James Kemnal, Company Chairman and Henry Smith, Chief Engineer met a Colonel Ramsden at Balderton Works to discuss gun repair. What transpired is not recorded, but a battered photo shows employee Jimmy Pearson in the works with a large gun. During the war, pumping machinery was lost at sea due to enemy action, this particularly applied to Steam Pumps being imported from the U.S.A. As an example, losses during the year ending 31st December 1917 were valued at £16,664/7/10. In 1917 the name of the Company was changed to Worthington Simpson Ltd. In 1918 the total number of Worthington Simpson employees was 800 of which 130 were female, most of the latter having been recruited for the war effort. P.S. The address changed to Lowfield Works in 1936, when the Engine Trade had almost ended. Extracted by Peter White from his book "A History of Worthington Simpson"